I do love recycled clothing. Because I am semi-crafty I can even make my own. For those who just don’t have the time (or the desire) to repurpose clothing, RE-DEWIN has the answer. All of Redewin’s clothing is made from previously loved (Ah-hem, VINTAGE) clothing which is pieced together to make something new. Our favorite is the patchwork dress pictured here. My three year old is jumping up and down saying, “I need that dress”. 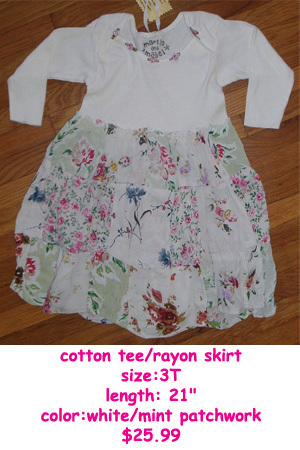 In addition to the adorable children’s clothing, Redewin also carries many fashionable women’s items. Each item is unique and has only one size available, so you are sure to have a one of a kind! The prices are reasonable (of course, shopping second hand is always the lowest cost). Children’s items range from $18.99-$34.99, Women’s items are a bit pricier but look to be well worth the cost. These are clothes you can feel good about buying “new”. What a lovely idea – great clothes at reasonable prices plus are eco-friendly.